Medix Select was founded by holistic physician David Brownstein and cardiologist Chauncey Crandall. Their line of nutritional supplements, manufactured in cGMP certified labs, target issues ranging from restless sleep to low male sexual function. They also have a supplement targeted for optimal thyroid functionality called Actalin. Actalin is relatively popular – almost entirely due to the amount of advertisements Medix Select has put out on the internet. It seems that whenever you search for something that contains the word thyroid in it, a link for Actalin pops up nearby. I’ve seen estimates that state Medix Select spends at least $10K every month on advertisements alone. Let’s see if Medix Select spent as much on research and development for their supplement Actalin, as they did on advertisements for this thyroid supplement. Actalin is a all-natural, dietary supplement created by David Brownstein, a holistic physician, designed to support healthy thyroid functionality. It includes 17 ingredients within each capsule, which we will talk about more later, and there are 60 capsules in each bottle. It is recommended that you take two capsules a day – preferably with meals. Actalin costs $39.95 for one bottle without shipping and handling. Shipping and handling is an additional $6.95. There is a discount for bulk purchases – buying Actalin for three months at once will cost about $30.00 each, or $90.00 total. With or without the bulk discount, Actalin is the most expensive thyroid supplement we have viewed thus far by a significant margin. 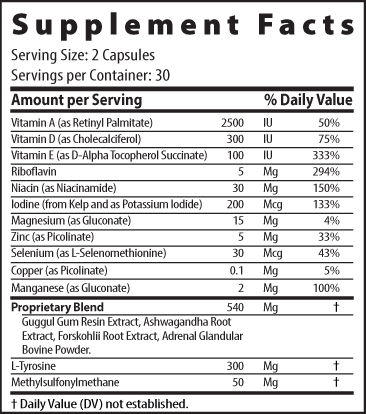 As seen in the supplement facts image to the left (or above if you are on mobile), Actalin is a very comprehensive thyroid supplement with a lot of vital vitamins, minerals, and amino acids. If you follow my other articles, you know that Iodine is the most important of these ingredients for an under active thyroid so it is great that this thyroid supplement includes it in in their supplement. I am also reassured in the effectiveness of Actalin since it includes selenium and l-tyrosine, two other minerals and amino acids I would consider to be essential to a thyroid supplement. However, there are also some ingredients in Actalin that I wonder whether they really help the thyroid. For instance, I was not able to find any studies or scientific evidence that methylsulfonylmethane, commonly referred to as MSM, has any real benefit for the thyroid. The same thing can be said for Riboflavin and Niacin as well, which although can help a bit for short term energy, seems to do little for the thyroid in the long run. It leaves me to wonder whether Medix Select, the company behind Actalin, decided to include the ingredients in this supplement with the thyroid in mind or whether they included a lot of filler ingredients to make Actalin look more comprehensive. Actalin looks more like a multivitamin at this point then a thyroid support supplement, or complex. There is certainly good minerals, vitamins, and amino acids within each capsule as we discussed earlier, but it is possible that these ingredients get overshadowed by the less essential, yet filler ones. I would have liked to see that Actalin included the essentials and then more. It seems that they decided to make another approach, though, and I am not really sure that it payed off. In the next section, we will determine the effectiveness of this thyroid supplement. However, before we dive into that, I want to mention that Actalin also contains Adrenal Glandular Bovine Powder. What this means is that each Actalin has a bit of crushed adrenal glands from cows within each capsule. The idea behind this is the capsules would thus contain some T3 and T4 hormones as well. However, most thyroid experts and physicians would consider this dangerous as the unregulated nature of dietary supplements leads to unknown amounts of each hormone in each capsule. It is possible that one capsule could contain a ton of hormones, and yet the next would contain almost nothing. The different amounts of hormones in each capsule has the potential to really mess up your thyroid. You can read more about why taking dietary supplements that include raw glands is a risky and dangerous idea here. With a supplement this expensive and comprehensive, one would think that Actalin would be able to solve every and all issues with your thyroid, but this does not seem to be the case. Perhaps this is a result of trying to fit too much into a single capsule or maybe it is that each ingredient is extracted from low quality sources. Whatever the reason is, Actalin is not very effective, especially when compared to many of the best thyroid supplements we have reviewed. Actalin covers all of its bases, but seems to have spread itself far too thin to really help those with hypothyroidism or an under active thyroid. Ordering Actalin from Medix Select’s website presents another problem – many former customers of Medix Select report that it is fairly difficult to stop their subscriptions. Medix Select offers a “smart ship” program where they give free shipping and a slight discount. They automatically include this subscription service in the low priced trial they offer to new customers. Basically if you pay around $10, you will receive a trial bottle of Actalin in return. However, you will also be automatically signed up for their a subscription service where every 3 months, they automatically charge you and send you 3 bottles of Actalin. Many former customers report difficulty in canceling this service, resulting in unwanted charges to credit cards and unwanted and unused Actalin bottles. Be sure not to get trapped in their automatic service if you chose to order Actalin. It could be a costly mistake. Can you use this if you don’t have your thyroid? 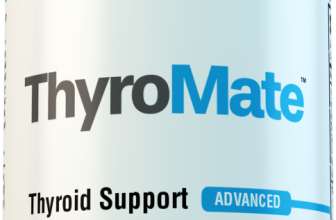 If you have had your thyroid removed, in my opinion it is impossible for a dietary supplement to help you. You will likely need to take T4 drugs such as levothyroxine for the rest of your life. I started using Actilin, 5 months ago quit taking the Levothrowracxin, maybe not spelled right,, I feel a 100 x’s better than when i was on all the medication i was on.btw, i don’t take anything now but Actilin.My Dr. pretty much confirmed that the Rx’s are not to cure just mask and suppress symptoms.My daughter also uses it, she’s not as through with hers as i am. i been taking levothoraxine for more of 15 years ..
and star taking actaling … for my self ..or i have to ask my doctor abouth it ? I love your review. Actalin has really saved my life. My Dr said the same thing that natural supplements do not work. After my lab results he said keep doing what you are doing. It is working. I have been taking it for 4+ years. My labs last week were normal after all this time. I highly recommend it! Hi Lori, I’m very glad Actalin works for you. I was diagnosed Hyperthyroidism/Graves. Does Actalin works for Hyperthyroidism disease? It would probably be best to ask your doctor about it first. Can thyroid supplements like Actalin help you if you got your thyroid removed? Very unlikely. The vitamins, minerals, and herbs in these supplements can be used by other organs and help in that regard, but no hormones can be produced through these supplements, without a thyroid. Gives me gas . What is that about ? Usal cause of gas is low stomach acids. One can take a digestive enzyme or simply eat pinapple which has a natural enzyme. Just eat a spoon full of cut up pinapple before your meals. Obviously, it contains something that does not seem to bode well with you. It is not uncommon. Some people report feeling better with a specific supplement while others report unwanted side effects. Thank you so much for your honest review of this product. I have experienced difficulty with guarantees, stopping future shipments, contacting customer service, etc. with these products promoted on the internet. I will not be ordering this product. You saved me lots of trouble down the road. I had no problems at all with customer service when cancelling order. Ire ordered at a later date because I was waiting for a new card but they didn’t know that. They cancelled my order immediately and I had no problems. normally any medicine would not generally be palatable when chewed. Just saying…..
i’m taking Levothyroxine 75 and simvastatin. will actalin cross with my two medications? I chose to take Actalin instead of the prescribed thyroid medicine that my Dr. wanted me to start taking. Since I have been taking Actalin, I feel like I am going through menipause symtoms, yet once again at the age of 65. Is this normal or should I discountinue it and go on something else? This has happened to me too! I was already having menopause symptoms and started taking actalin. My symptoms got so bad over a couple of months that I no longer could sleep a solid hour without going to the bathroom or waking up with night sweats. I was going insane. I stopped taking it and within 3 days i was sleeping through the night again and my hot flashes and night sweats and brain fog just started disappearing. Anyone else have this experience? My husband has been using Actalin for about a month. He is now often sweating profusely without any probable cause. He is diabetic. He gets insulin shots and metformin, however, his diabetic treatment has never given him perspiration as long as its been normal. Due you know if the perspiration could be a side effect of Actalin? It absolutely did that to me. I started having body odor an hour after I showered and this came along with extreme menopausal symptoms. Can I take Nature Throid 97.5 along with Actalin? Do I stop my thyroid medicine? Normally you can take thyroid supplements if you space them out with your medication. Best to check with them though! Will taking Kanchanara Guggulu with Actalin o.k. or would it cause issues internally? I started taking Actalin about a year ago. I had been on Synthroid for over 8 yrs and my dosage just kept going up every year. (from 25mg to 125mg). I’m 44 yrs. old and didn’t want to keep increasing my dosage without trying something new/natural. I read lots of info and felt confident in giving Actalin a try. I notified my doctor and did blood tests every 3 months to see if it was working or not. My doctor was skeptical but, agreed to follow ups. When I started taking Actalin I slowly took myself off of Synthroid (month). After the first month then I was completely only taking Actalin by itself. After 3 months total I went for my blood work. I was at a 12. Normal range is between 0-4. I kept taking Actalin and tried to eat a little healthier (more greens and less carbs which I still try to incorporate in my family’s life). After 3 more months I went and did another blood test. This time I was down to 8. My doctor suggested I increase my dosage of Actalin to 2x’s a day instead of once a day. I did this 5 out of 7 days for 3 more months. Good news…..on my last blood tests I was in the normal range down to 3.8!! I am super excited to get my thyroid working on its own and doing it naturally. I highly recommend everyone to at least try it, with of course the watch of your doctor. Yes, I do pay more now for this supplement than I did for my script. But, hopefully someday in the future my thyroid will get the kick start it needed and I will be able to completely go off all supplements (if not, at least I’m taking something that’s natural). I want to thank Dr. Brownstein for doing the research and offering us an alternative to medication. Oh, I forgot to mention if I’ve had side effects or not. I never really experienced any bad side effects. My periods are a little more regular now, I lost 15 lbs, and I don’t have muscle cramps in my legs anymore especially at night, I sleep pretty good now too 🙂 Hope this review helps.